The usual response was at a; but sometimes at b. may be the best approach play in certain circumstances. See OngoingGame2. The 3-3 play is the obvious response to the distant approach. However, if Black as here starts in the corner with the 3-3 point, and White makes the low approach , looks a little slow. To me that suggests that the symmetrical 5-3 approach to 3-5 is an acceptable way. Nonetheless, it has fallen out of favor. dnerra: On the other hand, White would usually not approach a 3-3 stone with a low approach 3-3 point low approach. In the diagram, might be a little slow, but is too close to the very solid black position. So probably needs another move added now, probably a two-space extension at a. 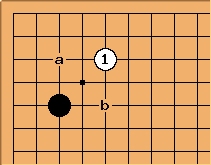 My impression is that Black has secured a little more territory than White with his two moves. (Everyone is welcome to disagree here!). So the conclusion would be that is a special strategy dictated by surrounding positions. 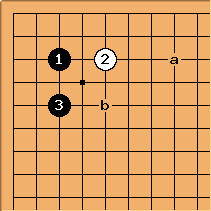 For example, /White a might be an ideal expansion from an enclosure in the lower left. 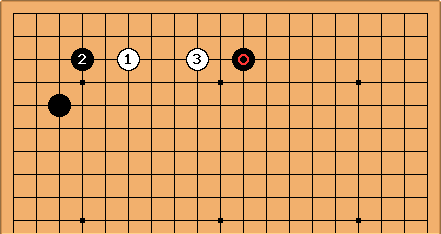 Or (in a later stage of the game) White could have very a strong position in lower left, so that she is planning White b instead of White a as a reply to . DaveSigaty: I have had this played against me several times. Regardless of what the pros think, I believe that it is a viable approach at the amateur level that prevents Black from trying anything tricky. Charles A pincer, of course, is unexpected. 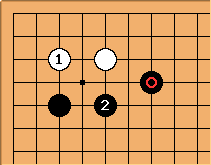 This unconventional pincer was played a couple of times by top players (Yamashita Keigo, O Meien) in 2000. In both cases this happened. How about the 'very distant low approach'? Since invites the very good play , this play is very rare. There are some classical examples of played, effectively as a wedge, in the presence of . In this case at , at might look ideal for Black. All of the marked plays are found in pro games. 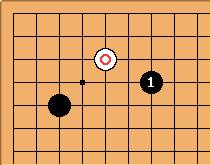 In modern go the plays closer to the corner seem to be preferred.